Guy Von Dardel, Raoul Wallenberg’s brother passed away in Geneva, on August 28th., 2009, at the age of 90. Despite his advanced age, his death was premature in a very important sense, for Guy has devoted his whole adult life to campaign for his brother Raoul, who vanished in 1945, victim of abduction by the Soviet forces. Unfortunately, he passed away without achieving his lifelong dream to get Raoul back home. 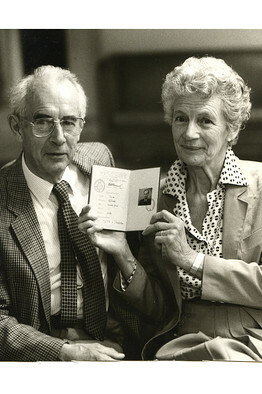 Von Dardel, a particle physicist, together with his surviving wife – Mathilda, and daughters, Louise Von Dardel and Marie Dupuy, led an uncompromising quest to get answers about the fate and wherebouts of Raoul Wallenberg, the Swedish diplomats who managed to save scores of Hungarian Jews from the Nazi claws. Until his very last breath, skeptical about the official Russian version that Raoul died in a Soviet prison in 1947, Guy Von Dardel devoted himself to the sacred goal of bringing Raoul back home. Guy Von Dardel was a source of inspiration to all those who cherish the values of civic courage displayed by Raoul Wallenberg. In an unprecedented initiative by the International Raoul Wallenberg Foundation together with the Jerusalem Working Group, a Kaddish prayer will be offered at the Jerusalem Western Wailing Wall (HaKotel Hama’aravi), this coming Tuesday – September 1st., 2009, at 05:00 pm Jerusalem time. The public is hereby invited to attend the Kaddish ceremony. The burial of Prof. Von Dardel will take place Thursday September 3 at 3PM at Eglise Evangelique Lutherienne,Place du Bourg de Four in Geneva.